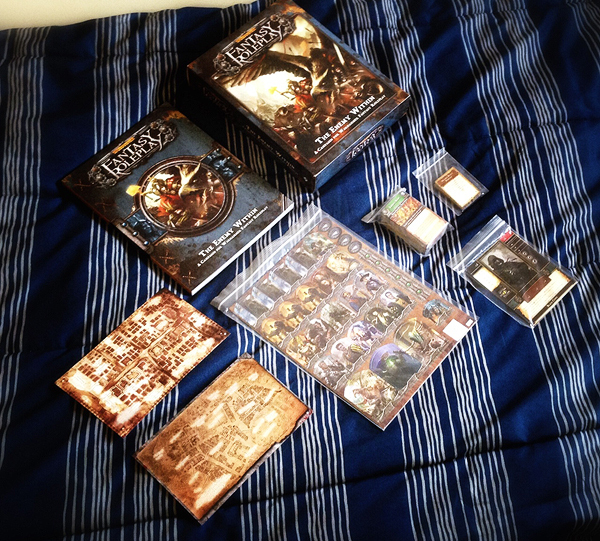 One of several RPG goodies I got for Christmas included The Enemy Within campaign boxed set for Warhammer Fantasy Roleplay by Fantasy Flight Games. I don’t play Warhammer, but got this set based on word of mouth regarding this adventure being a reimagining of the original release which is highly regarded as one of the best RPG adventures ever produced. The boxed set includes a campaign sourcebook, nearly 100 cards (for items, conditions, locations, creatures, backgrounds and clues), two back-and-front mini map sheets, 24 punch out tokens and four handouts. Each of the set pieces have elaborate, well-done art throughout, with my favorite (aside from the sourcebook) being the punch out tokens, and least favorite the maps, only because I’m so used to maps being bigger in size compared to these card-sized productions. 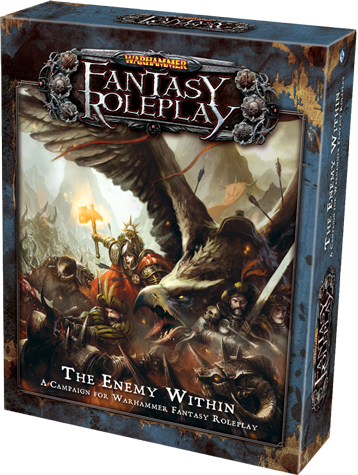 All the contents for the Enemy Within boxed set for Warhammer Fantasy Roleplay by Fantasy Flight Games. I’m about a chapter into the sourcebook so far and I really like how this campaign adventure is laid out. Throughout the beginning of the campaign there are several events that the PCs can get involved in which prompts them into an investigation of possible corruption within the city of Averheim. Each encounter is pretty detailed on the location, the NPCs involved and how it all works in to the major story of the campaign. In one instance the PCs may decide to provide protection to a noble which can lead to an assortment of outcomes depending on the group’s actions; from a possibly deadly highway robbery to the discovery of the robbers’ hideout where information of the main antagonist of the game can be gained. 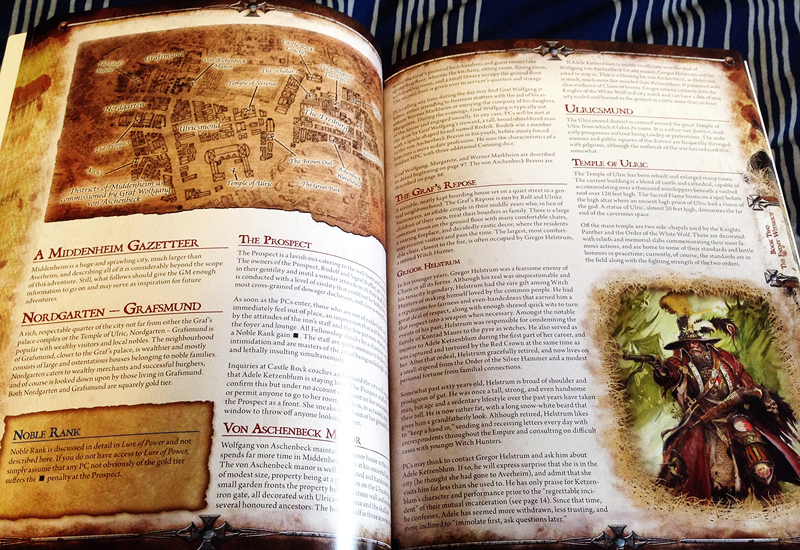 A couple of pages from The Enemy Within from Warhammer Fantasy Roleplay. Something that I thought that was clever is that the main antagonist’s identity is all dependent on the game master. In the beginning of the book, the GM must choose between three leaders of the city to become the Black Cowl, the primary enemy of the campaign. The book then features blocks of texts advising GMs how to handle certain portions of the game depending on who they have chose as the Black Cowl. I don’t play Warhammer Fantasy Roleplay, but this campaign book has me interested. From what I’ve read so far, there are several encounter ideas that can be used in similar fantasy games. As I continue production into my Numenera campaign, I’ve been looking at the different ways writers approach their adventures, and I’m glad that I picked this campaign up to see how a variety of options not only benefits the fun factor for the players but for the game master as well.